In my previous post on mat time I wrote about how to use and introduce mat time to your little ones, including the benefits that mat time brings to you and your child. Mat time allows you to go anywhere and place a simple boundary on the ground for your child to play quietly in while you can relax knowing they are safe, quiet and happy. How do you cater for mat time when you are out and about though? 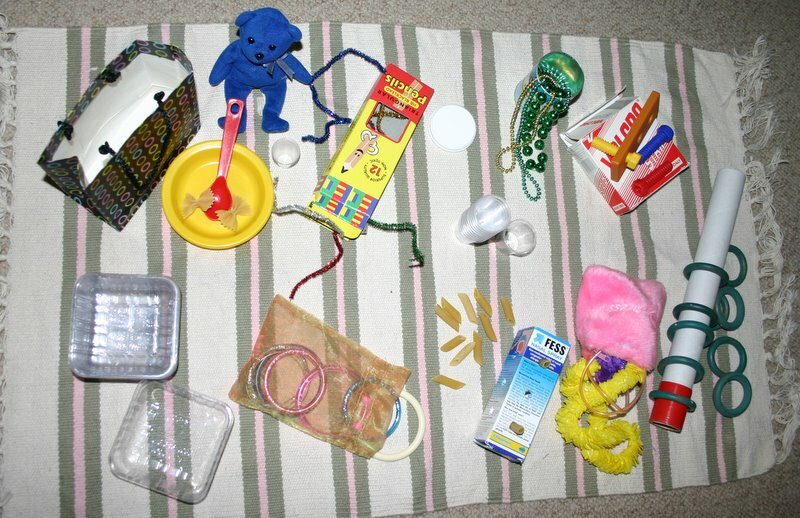 I like to keep an activity bag in the car or near the front door with some special toys inside that are used only for this purpose to keep interest levels high when I do pull them out. I don’t have enough commercial toys to put a whole bunch out of circulation so I like these toys to be simple hand-made activities or items that won’t be missed. I have a small mat that also stays in the bag, acts as the boundary and gives the children something comfortable to sit on. I put everything into little bags, containers or boxes as this doubles the interest factor. Once we have finished with the toys I do have to spend a few minutes returning everything to its own container but as I don’t use them all the time, I’m happy to do that. With a small amount of preparation and some training at home, you can have a toddler who happily sits down for an extended length of time to focus and play quietly with their own toys. Perfect for Grandma’s trinket filled house or a coffee date with the girls.